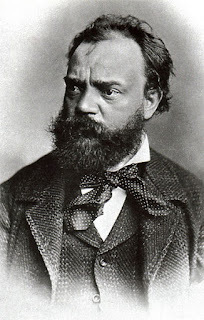 During my morning walk on Saturday, I heard this beautiful version of the "going home" theme from the Largo movement of the Czech Romantic composer, Antonin Dvorak's wonderful "From the New World" Symphony #9 played on "All Classical Portland". The version I heard was for cello and piano. This is one of my favorite movements of any symphony played by full orchestra, and it translates well to the cello. I thought to myself what a soothing, peaceful, and beautiful melody for the Tales Sunday version of the blog's all classical weekends. Please turn up the volume and relax and enjoy this beautiful music from one of my favorite composers, transcribed for cello and piano. On this version I found on You Tube, it was arranged by the cellist, Steven Sharp Nelson and pianist, Jon Schmidt. Thank you! It was a soothing cello melody! You are right! I used to play this on the piano as a kid. Couldn't play it as slow as here, though. Beautifully soothing.